How literate are Australians? Large-scale studies of grade four children, 15-year-olds, and adults suggest that far too many Australians are struggling with reading and spelling. This study by the International Association for the Evaluation of Educational Achievement investigates fourth-grade students’ reading achievement. The Australian Council for Educational Research has published highlights of the 2016 PIRLS data from an Australian perspective. Click here to read this document yourself. Australian kids’ average score had improved by 17 points to 544 points since the 2011 study, putting them ahead of kids in 24 countries, but behind 13 countries (see p16 of the report). However, many kids continue to have serious problems. Only 81% of Australian students met the “proficient” standard (475 points), and 6% of kids fell below the Low standard (400 points). Only 57% of indigenous kids achieved the “proficient” standard and 18% fell below the Low one. This is an OECD assessment of 15-year-olds’ ability to apply learning to real-life situations, which started in 2000. 72 countries were involved in the 2015 study, with 14530 Australian students participating. Australia was equal 12th in the world on reading, but its students’ performance declined by 12 points between 2009 and 2015, a significant change. Only 61% of Australian students achieved the National Proficient Standard in reading literacy. 11% were high performers and 18% were low performers. Here’s a lay-person’s explanation from the Sydney Morning Herald. The Australian Bureau of Statistics has been involved in surveying adult literacy since 1996, with major reports published then, in 2006 and most recently in early 2013. 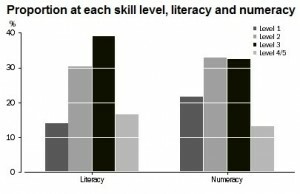 Like the earlier surveys, the most recent survey found that a very significant number of Australian adults have very poor literacy skills or are functionally illiterate, and that an astonishing 44% of adults lack the literacy skills required to cope with the complex demands of modern life. No, that is not a typo. Forty-four percent of Australian adults can’t read at the level our society expects of them. Why nobody is rioting about this remains a mystery. For a summary of the most recent data, see the ABS website.